Wireless bluetooth pulse oximeter for Android devices and the StressLocator biofeedback Application. Measures much more than just your blood oxygenation and heart rate.Now compatible with Polar H7 and other BLE devices too. 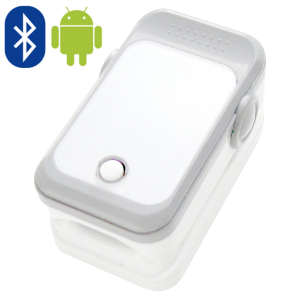 The StressLocator oximeter is connected to your Android device via bluetooth, if you don’t have one, you can use for example our Ear sensor or newly even Polar H7 and other similar BLE equipped devices that can measure HR and RR intervals. The Android device must have either the StressLocator Pro or the StressLocator Free app installed. You can buy the oximeter here. More information on the application is provided on this website. Compare your results with users around the world and compete for a place in the Top 10.